The dream I had last night let all my anxieties out of their trap, and played out in my mind as if on a movie screen. It was my usual recurring dream of having to do an exam that I hadn’t prepared for, and so much was riding on the outcome of this exam. The odds were stacked against me – the subject was horses, which I know nothing about – and I would fail if I didn’t get 40%. The F word scares me at the best of times, and I felt myself freeze, with time ticking and no ideas coming, and the prospect of failure looming large and real. Time and opportunity were literally galloping past me. I relied on lateral thinking and intuition to complete one of the papers – hoping that would be enough. But later I had to give the exam paper to a group of students who were resistant to doing it, and who were going to copy it and cheat later. I was outraged, but also admiring of their nerve and insouciance in the face of risk. I don’t usually look up dream dictionaries, as I believe that the meaning of a dream is in the mind of the dreamer, but on this occasion I did. Turns out that horses in dream symbolise risk taking and excitement. I’ve thus been pondering whether there’s an opportunity I’m not taking advantage of. I’m reminded of an Italian phrase I learned years ago about opportunity being a horse that gallops by and you either jump on it as it passes you, or it has gone by so fast that you’ve missed it. All you can feel is the whoosh of dust in your face, and all you can see is the swish of its tail as it canters away into a future that isn’t yours. 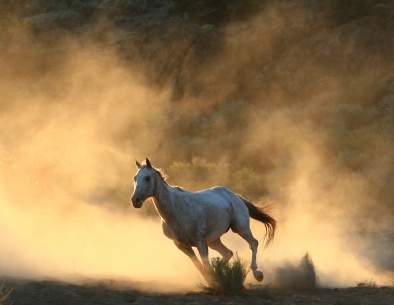 Symbolically, horses also represent spirit, or freedom. I have longed visualised myself being freed from my self-imposed shackles, and I wonder whether the people who forced me to take the exam in my dream are my own restrictions on my creativity and abilities: forcing myself to make the best of a bad job in a bid to scrape through to 40%. Whereas I envy the resistors who got off scott free, without doing the exam, and were true to themselves and their own power. I’ll be riding that horse metaphorically all day, and tuning into the feelings the dream evoked, to identify exactly what risk is galloping past and whether I want to jump on it or let it go. This entry was posted in creative imagination, creativity, dreams, soul recovery, symbols and tagged creative imagination, dreams, holiday, horse symbolism, Norfolk Broads, postaday2011, soul by inktuition. Bookmark the permalink.